When Is a Hero not like Hugh Jackman? 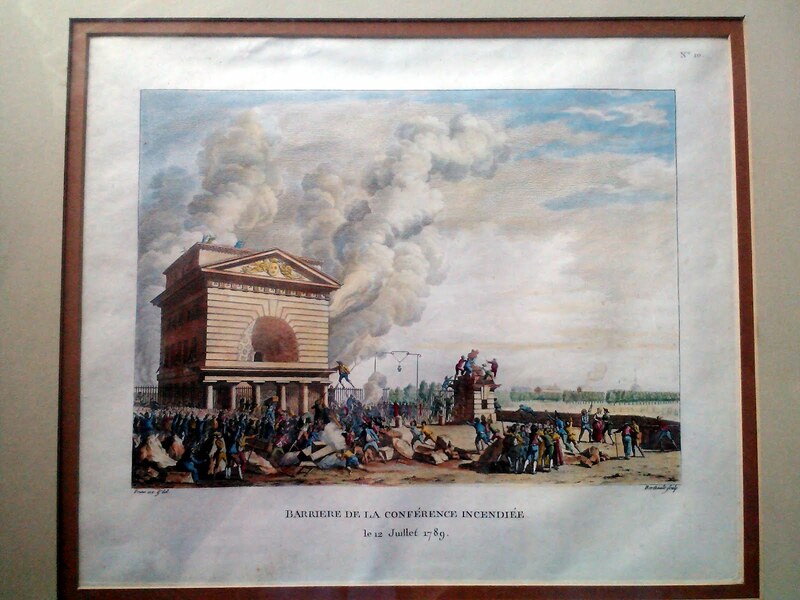 The text reads "Barrière de la Conférence Incendiée, le 12 Juillet 1789." 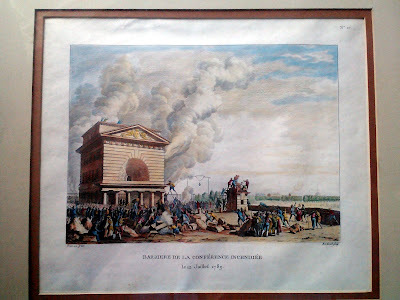 (The Conference Gate Burned, July 12 1789). Here's a less blurry one that doesn't show the frame, if you click on it, you can see it up close. In the right-hand corner it says "No. 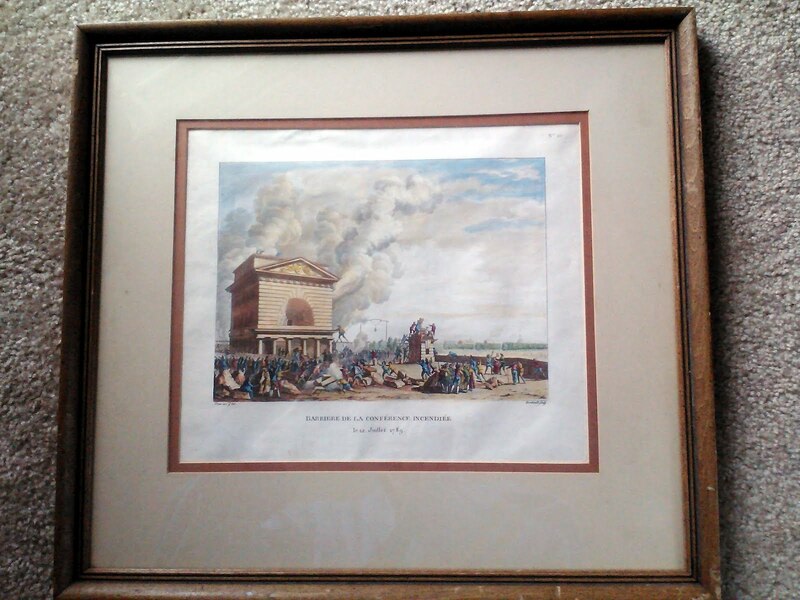 10," and small text along the bottom edge reads "Prieur inv. & del." and "Berthault sculp." Prieur inventeur et delineateur (creater and artist), and Berthault sculpteur (engraver), I assume? 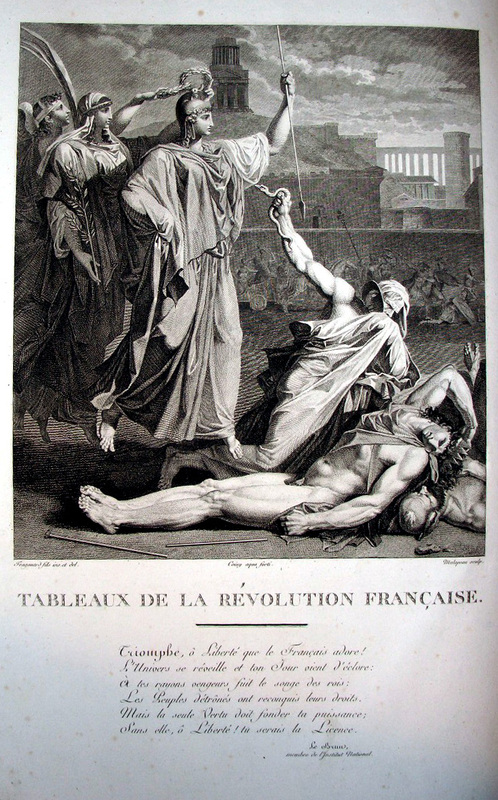 The engraving was originally published in Collection complete des Tableaux historiques de la Révolution française. To see a nice high-res version of the engraving in black and white, go here, and to see more engravings in the series, go here. I have no idea how old my copy of the engraving is or if it was made from the original plates, but it does look hand-colored! If I'm right, that suggests to me that it's fairly old. We have chosen [...]the Barrière de la Conférence; it was the one whose destruction left the most regrets, when public terror was calmed, and when calm had led to reflection. Art lovers still regret the colossal figures[...]which particularly decorated this barrier: they were allegorical figures of Brittany and Normandy, who seemed to point out the route which led from the capital to these two provinces. The fire barely altered them, but the rage of the arsonists, determined to destroy all, led them to use iron, which cruelly supplemented the impotence of the fire, and erased the form when the substance could not be consumed. Buy anything cool lately? Tell me about it! How sad that the artist was guillotined! The destruction of the "colossal figures" of Brittany and Normandy reminds me of another loss which even my tourist-y family noticed when visiting Paris. At the cathedral of Notre Dame, the statues of Biblical kings decorating the ledge above the doors to the cathedral were all beheaded during the Revolution because the public mistook them for kings of France. It saddened all of us that the statues (the surviving parts of which were wonderfully Gothic looking) had lasted 500 years only to be destroyed in a case of mistaken identity. Alyssa--It really is sad. And you'd think they'd be embarrassed to print his work! But I guess it was just one less person they had to pay royalties too. I have mixed feelings about the whole art-destroyed-in-the-Revolution thing, I'll admit. It's always sad to see something beautiful erased, but...if I were a poor French person, big statues would probably not be high on my list of priorities either! Even though I love art and books and hearing about things go away so that we can't see them makes my heart cry (my uncle just told me about the Conquistadors burning Mayan and Aztec books and I practically stopped breathing with rage)--I just can't cry about those French Revolution smashed things. It's really easy to tally up the artistic cost of the Revolution, because all those things were tangible, permanent objects. They were documented, and now they're gone or broken. But the cost of the Ancien Regime can't be tallied or pointed at because it was in human happiness and lives and those things are temporary and intangible.